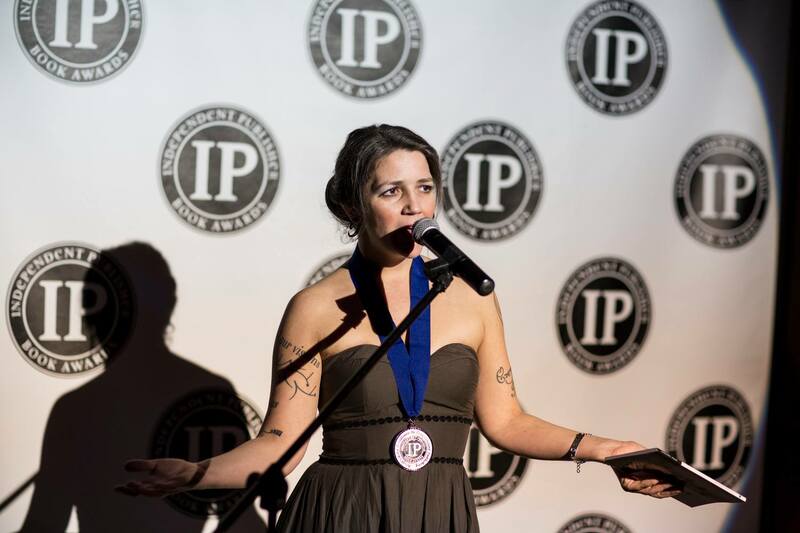 Marty McConnell at the IPPY Awards. Marty McConnell personifies stage meeting the page, part of a generation of poets equally at home performing and publishing their work. A member of seven National Poetry Slam teams representing New York City and Chicago, McConnell was also the 2012 National Underground Poetry Individual Competition (NUPIC) Champion. She is the author of wine for a shotgun, a finalist for both the Audre Lorde Award (Publishing Triangle) and the Lambda Literary Award for lesbian poetry. McConnell’s work has been published in numerous anthologies, including A Face to Meet the Faces: An Anthology of Contemporary Persona Poetry, City of the Big Shoulders: An Anthology of Chicago Poetry, Word Warriors: 35 Women Leaders in the Spoken Word Movement, as well as such journals as Gulf Coast, Indiana Review, Salt Hill Review, Beloit Poetry Journal, Drunken Boat, and Rattle. McConnell has lived in Chicago since 2009, where she co-founded Vox Ferus, an organization dedicated to empowering and energizing individuals and communities through the written and spoken word. We spoke to Marty to take us Behind the Sestina, “one possible explanation of my utter and rather surprising lack of an adolescent tomboy phase,” included in The Incredible Sestina Anthology. When I was in grad school, we did a segment in Joan Larkin’s workshop on form poems, and I did a few of them–to my recollection, a sonnet, a pantoum, and something in iambic pentameter. She said to me, “You know, sometimes people try form and you can just see that it’s something they’re supposed to do, that it works sort of automatically with their voice. I don’t think that’s true with you.” Because, well, the poems were awful. So I kind of wrote off form for a long time, until I was making a shift from writing a lot of persona work into getting autobiographical again, and remembered vaguely a quote from Adrienne Rich about form which the internet tells me goes like this: “In those years formalism was part of a strategy–like asbestos gloves, it allowed me to handle materials I couldn’t pick up barehanded.” Regardless of the fact that she wasn’t actually talking about traditional form, the idea stayed with me that maybe I could get to terrifying ideas by writing them into existing structures – and there began a long, though sporadic, love affair with formal structures. Often, I will use form such as sestina either as a way to get started or as part of the revision process, but not end up with a form poem in the end. I think my favorite sestina is “Morning News,” by Marilyn Hacker. The form genius. What can you tell us about your sestina-writing life? I don’t write many sestinas, or write in form all that often. Generally, what happens is that a poem will start to form in my head and feel like it needs a specific kind of excuse for its repetitiveness, or a framework to hold it. I actually write many more pantoum than sestinas, maybe because I fall in love with lines and want an excuse to hear the whole thing more than once. Can you walk us through the composition of “one possible explanation of my utter and rather surprising lack of an adolescent tomboy phase”? Was there a biographical inspiration to this, a real-life “brother”? I’m in the process of writing my second book, which has a lot to say about my relationship with my mother, particularly with regard to my thoughts and feelings about potentially ever becoming a mother myself. I started writing “one possible explanation of my utter and rather surprising lack of an adolescent tomboy phase” in the blank back pages of another person’s book a year or so ago, sitting on a pier in Wisconsin watching a girl who had twin brothers play with them and others and thinking about how different my childhood might have been had my mother not miscarried the boy she conceived between my second and third sisters, what it might have been to grow up in a household that included a brother instead of two sisters, how that might have influenced my way of interacting with male-bodied people. The poem was a terrible failure in all of its early forms, until out of desperation to make something of it I started playing with putting it into various traditional forms just to see what would happen. I think that by radically re-writing it as a sestina, I was able to release my expectations and aspirations for it in terms of content and just focus on the form, allowing my subconscious to supply the content in surprising and, quite honestly, moderately disturbing ways. It is not the poem I set out to write at all, which is maybe the key to its success. You’re a poet who is also a dynamic performer. Do you have any thoughts on the sestina as something performed or heard at readings? I’m always of two minds about form being declared before it is performed–on the one hand, I like knowing something is a sestina or pantoum or whatever so that I can listen for it. But I think that’s really just my geekery, and really the best thing to do is just read a poem as a poem, and let the audience receive it however they will. Because so much poetry involves repetition as a technique anyway, I think the sestina tends not to announce itself in the way that a pantoum does, but the repetition can be incredibly effective in performance. It depends though on what the end-words are… if you’ve chosen really ordinary words, it’s not going to be as impactful or apparent as it would be if you’ve picked words that draw more attention to themselves. 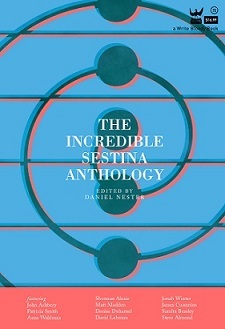 I think sestinas make great performance pieces without any need to announce them as such. Mrrrrr. Well, I guess it would be dedicated to the ghost of the brother I didn’t have. Or to my nephews, Orson and Calvin. Maybe all of the above. This entry was posted in Behind the Sestina and tagged Chicago, Indiana Review, Joan Larkin, Lambda Literary Award, Marty McConnell, National Poetry Slam, New York City, Poetry, Sestina. Bookmark the permalink.